Are Millennials delayed starters or just enjoying life while they can? 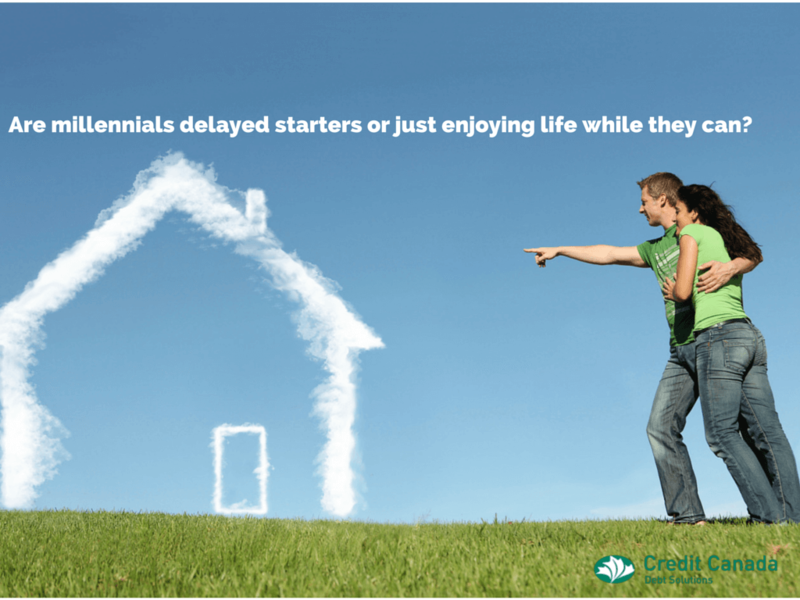 Recently Credit Canada CEO, Laurie Campbell wrote a blog highlighting the reluctance and of many of today's Millennials to move out of their parents' homes and start their own financially independent lives. As a Millennial who bought my first home at the age of 26, I can tell you how confusing and frustrating this can be even to us, as we are now divided between those who have moved out on our own, and those who haven’t. Those of us paying our own rent or mortgage since our late 20s or early 30s could not fathom the thought of living at home while trying to explore adulthood, having our parents worry about every questionable decision we made, or having to do our chores on someone else's schedule. I couldn't even stomach the thought of saying I still lived with my parents. Oh the embarrassment! For my “still living at home” friends however, these are small trade-offs for the luxury of having someone else cook their meals, and the financial freedom of being able to take one to three nice vacations a year while still buying designer clothes and coffee everyday. Their idea of a nice vacation is a trip to Europe or the Caribbean at a 4 or 5 star hotel. My idea of a nice vacation is anything that involves going on an airplane. And this is where the frustration comes in. We Millennials who no longer live with our parents are caught in this awkward stage of balancing our friendships with our budgets when it comes to our friends who haven’t moved out as yet. Whether though renting or buying a home it creates a clear divide. Have you ever tried planning a vacation with someone whose budget is completely different from yours? They want a deluxe hotel, and you’re left arguing that while a 5-star hotel makes sense for vacations where you relax or stay on the beach, a clean 3-star hotel with great reviews or even *gasp* a motel is fine for trips where you’re out doing activities and sightseeing all day. Or how about shopping? The clueless expression on my friends' faces when I tell them that yes $90 is a great deal for those designer sneakers, but no I won't get them because $90 is a lot to spend on an impulse purchase. After spending years wondering how anyone could be okay still living with their parents into their 30s, I realized those same people were wondering how we could tolerate not taking semi-annual vacations or having money for impulse indulgences while we are “still young”. And there it is...some people just don’t feel the same sense of urgency to move out as quickly as others. My parents made me feel like if I didn’t buy my first home by my late 20’s, there was some race against my peers that I would lose miserably. The ever increasing rent they charged me reinforced this thought. So making changes in my spending to achieve this goal didn’t really seem like a choice, but more of an inevitable outcome. Maybe this sense of urgency is what some of our fellow Millennials need to leave the nest. After all who wants to trade in a life of trips to Paris, New York and Belgium while buying expensive clothes and electronics, for a life of paying bills and worrying about groceries? Then again, do we really want a bunch of people getting themselves into credit card debt as a result of juggling these finer things in life while covering rental or housing expenses? It’s a scary thought.